As we all know Nagy will value a RB who can catch the ball and I have no idea how good he is at that but as purely a runner I love watching Elijah Holyfield...he is the perfect combination of size, power and speed with the ability to run a guy over or make him miss in the hole...he attacks defenders...if he is there in the 3rd he would be an excellent pick up (if he shows some hands). I like Justice Hill from OK State. He can catch, run routes and has the long play gear. I think he is more Cohen then an every down type of guy who can carry the load. 1. 3rd round pick 88 as of 20 Jan 19. With our pick we select Erik McCoy Teaxas A&M, who is 6.4 & 315 lbs. McCoy is as talented and well rounded as any interior offensive linemen in this class. He can play power or zone systems and pass and run block at a high level. He should step right into the league and start for a team from day one. With Heistand to coach him he should be able to replace Long as early as 2020. Long can then switch to swing guard. McCoy has a 2nd round grade in some mocks and that will depend on the Senior Bowl & Combine reports. We beef up the right side and will address a backup center in round 5. 2. 4th round pick 120 as of 20 Jan 19. Pace has done incredibly well in the middle rounds and we select Cameron Smith from USC as an ILB. He is 6.2 and weighs 254 lbs. Smith is a solid inside linebacker who is a good run defender. He has improved his pass-coverage skills, but he is a bit stiff and slow to cover for the NFL. Smith will need more development to become a pro three-down starter. In 2018, he has 81 tackles with 7.5 for a loss and four passes broken up. He can be coached up by Glen Pires to be a 2-3 down starter by 2020. 3. 5th round pick 152 as of 20 Jan 19. We select Connor McGovern who is a C from Penn State. He is 6.5 and weighs 315 lbs. He gets into position and lines up trap blocks well with his understanding of the play’s development and also fights well with excellent hand placement to go along with nice choppy feet. He is not overpowering by any means but he is very quick out of his stance and wins with leverage and speed on interior blocks. McGovern can anchor down but he can still be moved off his spot and needs to add more thickness to his frame to maximize his potential. Another project for Heistand. I really like the way this guy runs. I think what he shows at the combine drills will be pretty revealing for his future as a receiver. UGA didn't use him in that role but they had D'Andre Swift. I'd much rather take a RB in round 4 or 5 than round 3. Get another edge rusher or CB depth in round 3, imo. 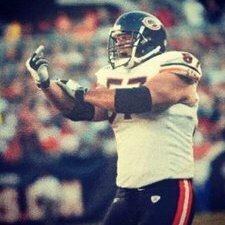 The OL was the reason the Bears lost the playoff game. They were dominated most of the game. Two OL men? You basically want to upgrade the entire right side? We are losing someone on the rightside and the year after we probably lose the other. There cannot be a draft where at least 1 serious OL prospect is not picked. Two also allows for potential depth. I personally think adding 3 new guys every two years is a good practice. Replace Massie and you're good, but what of Leno goes down? Or when Long (inevtably) drops? Need to keep adding young bodies and develop them, rather than adding 28 year old journeyman to hope they can fill a role. I like Coward, but he shouldn't get any starting role without competition IMO. Bruce Anderson out of NDSU is another back who looks like he could be an excellent fit in the scheme come the mid-rounds...I love the idea of signing Hunt then still drafting a RB...that allows you to get Cohen out more in space as a receiver and gadget player...him with Gabriel on the outside would be so difficult to stop for any defence. Would anyone trade our 4th this year and our 2020 2nd to move up into the 2nd this year? No...plenty of value in the mid rounds this year...especially at positions of need. I think we should look at a guard in the 3rd or 4th round. With Heistand we can afford to look in the later rounds but I like a couple of interior linemen in the 2nd/3rd round. Obviously we don't have a 2nd round pick.